Oh Em Gee! Did Sonam Kapoor Just Make A Big Fashion *Boo Boo*? When you're one of Bollywood's best-dressed stars, it's inevitable for a bad outfit to come your way. It's a lot of pressure to maintain your sartorial streak, especially when you are Sonam Kapoor, amirite? With the best stylist in B-town as her sister (Rhea Kapoor), Mrs Kapoor Ahuja's wardrobe is almost always on its best behaviour. The Kapoor sisters usually get everything from the colour to the fit to the vibe spot on. So you'd get why our jaws dropped on seeing Sonam Kapoor lose her fashion mojo for a sec in this eggplant coloured pantsuit. Sonam is currently in Switzerland for an IWC Watch launch and for one of the events, the actress wore an eggplant coloured look. Let's start with what we loved about Sonam Kapoor's complete look. We're digging the retro Twiggy-inspired makeup and hair as we are those simple pearl earrings. The bold purple shade and that Prada bow-tie with her shirt are to-die-for, as well. However, the rest of the look disappointed. 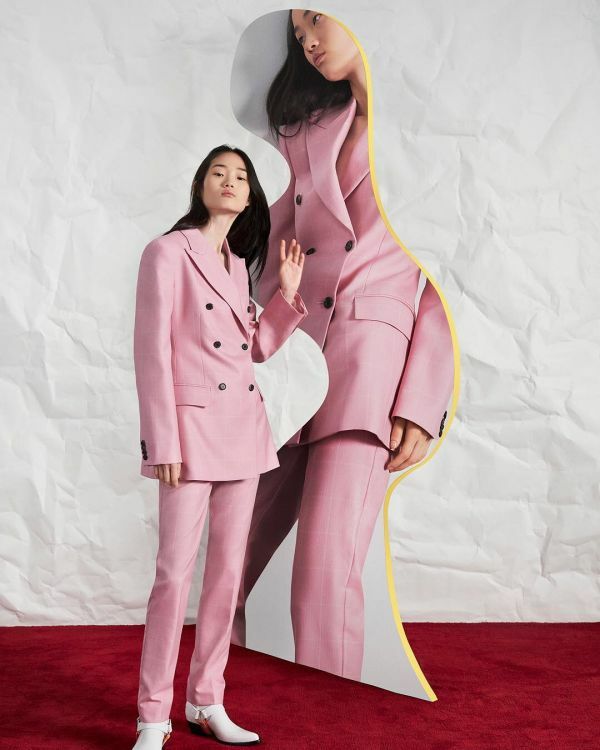 The Calvin Klein suit from their Pre-Spring 2019 205W39NYC collection boasts of slim-fit pants and a structured double-breasted jacket. Here's how the silhouette is meant to look... relaxed yet a vintage-style slim-fit. Sonam, as you can see wasn't able to nail it right. The suit jacket doesn't look structured... the shoulder's don't look bold and big enough to make a statement and the fit isn't relaxed around the torso either. The 'slim-fit' pants look tight and fail to achieve the '50s slim chino vibe and do NOTHING for her long legs. If Rhea had perhaps suggested a size bigger and cropped the pants, yes, the look could have worked to no end just like Rihanna. And it would have been a good day for all. Lesson: as easy as it looks, pulling off pantsuits isn't a piece of cake. It's all about the fit, ladies. Thankfully, this was the only miss out of a total of three looks Sonam Kapoor wore in Geneva. Looks like her midnight blue ensemble and champagne dress saved the day!